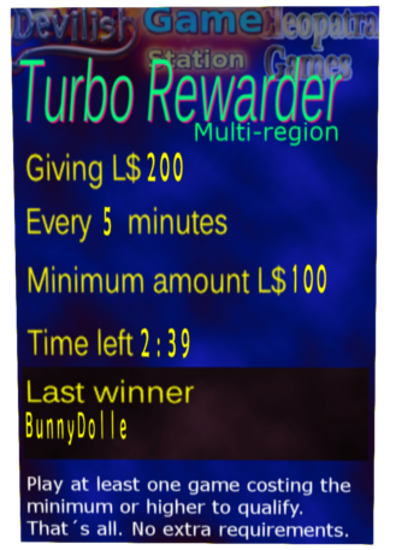 The turbo rewarder pays an amount every X minutes to one of the players played at least one game of L$ Y during that period. The amounts and the time are visibile on the turbo rewarder itself. The winner is selected random. * How many players are already qualified. Click the device and you’ll get a chat message as shown below, telling you exactly that. It seldom happens that the turbo rewarder has more than 40 qualified players. Often less, so if you play a game to qualify, your odds to win it are normally above 1/40th. If we get a lot of these players or they really stand in the way, we’ll adjust the turbo rewarder a bit. Sometimes the minimum amount is L$100, sometimes it is L$50. Please keep this fun for every one and don’t stand in front of the plate for hours, most of the time in away modes! * Simular devices elsewhere sometimes require a player to stay in the sim in order to have a chance on winning. We don’t make that requirement, you can leave or log off whenever you feel like. * Each qualified player has equal odds. Playing more games or playing higher amounts does not increase your odds. * Look for the actual minimum amount to play, prize and frequency on the device itself. * Some do play exactly one game every 27 minutes. Ok, that’s allowed. It is a pretty simple way to maximize ones winning out of this. And it can add on! Let’s say there are 40 players and the rewarder is set to a minimum of 100 L$ then your average win is 1/40th x 500/100 = 12.5%. This on top of your winnings on the games and other rewards. * You might find it extremely dull to play exactly one game every 27 minutes, for days in a row. You can still keep the turbo rewarder in mind. When you stop and see a new session just started, play one game more. Play when there are not a lot of other players. Spread your games more over time.